To Cite: Dehghani R, Kassiri H, Gharali B , Hoseindoost G, Chimehi E , et al. Introducing of a New Sting Agent of Velvet Ant Dentilla sp. (Hymenoptera: Mutillidae) in Kashan, Centerl of Iran (2014 - 2015), Arch Clin Infect Dis. 2018 ; 13(6):e60553. doi: 10.5812/archcid.60553. Background: Velvet ants (Mutillid wasps) are among the venomous and stinging insects, which their existence has been reported from different areas of Iran. Objectives: Since no study has been done so far in Iran in regards to their sting, their clinical complications and their sting are studied for the first time in Kashan. Methods: In this descriptive cross- sectional study that was performed during 2014 - 2015, 49 individuals stung by velvet ants in the residential areas in Kashan were assessed. Identification of the sting agent was according to the morphologic specifications of the collected samples of the insect in the houses of the injured. Sting complications in the individuals were studied according to the clinical manifestation and the time of the sting, which was from June to September. Results: In this study, the sting agent was identified as velvet ants, Dentilla genus. Most sting cases were in the age group of 11 - 20 years with 30.5% and the lowest belonged to the age groups of 31 - 40 and 41 - 50 years. The first sign of the sting was a severe and sharp pain. The highest percentage of redness in the individuals was 47% in the first day, and the lowest belonged to four or five days after the sting with 2%. Intense itching was one of the main symptoms of velvet ant stings. 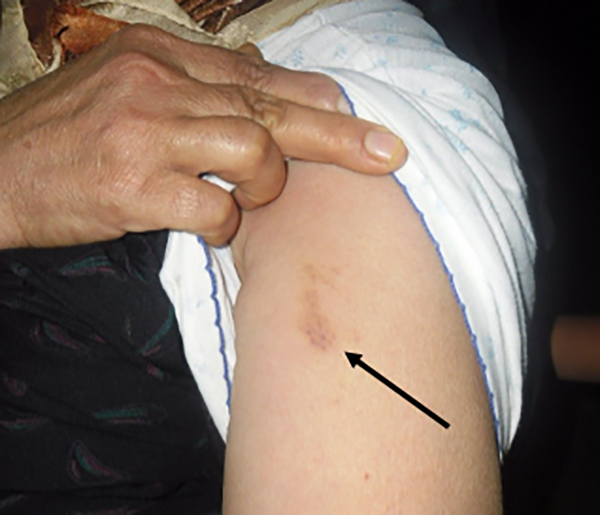 In the final stages of pain and itching, hemolysis and bruise signs were observed as brown spots. Conclusions: Velvet ant stings have not been reported so far from Kashan. Due to the high cases of stinging in the women carpet weaving workshops, their sitting rooms, and bed rooms, it can be concluded that this arthropod is a domestic pest. Therefore, control and prevention of its potential damages must be programmed accordingly. Fear from animals is normal due to the potential damages; however, in some cases it may be mixed with superstition (1). Some animal bites cause infection, poisoning, and diseases. Humans have always been exposed to the bite of venomous and non-venomous animals (2, 3). According to the geographical expansion and climate variation, Iran has one of the most varied animal and plant species. From the ancient time, the bite and sting of the venomous animals in Iran has been under consideration more than other medical topics. Scorpion sting and snake bite as well as their treatments has been a medical problem in this country. According to the varied species of these venomous animals in Iran’s wide area expanded from the Persian Gulf islands to the north regions (4-6), every year many cases of these animal bites or stings are reported (7-11). Some aquatic Heteroptera bite if they feel danger and their bite is painful and continues 2 - 3 hours (12, 13). Scorpions, which have been the center of attention due to their painful stings are one of the main venomous arthropoda in Iran. These arthropoda use their sting for feeding and defense (14). Bees are the most important and effective arthropoda in the environment. The bees of Vespidae family are social wasps. Some species of Vespa genus have been reported in Iran (15-21). Bees and wasps, including honeybees, paper wasps, hornet wasps, yellow wasps, and fire ants are the insects, which more probably sting (22-26). Fire ants, Pachycondyla sennarensis, are considered as one of the sting agents in Gheshm island of the Persian Gulf (27-33). In a preliminary checklist of the ants (Hymenoptera: Formicidae) of Iran, 110 species belonging to 26 genera of six subfamilies of the Formicidae were recognized (34). If social insects like wasps and bees are threatened, they attack humans in groups and this intensifies the problem. Unlike the snake bite and spider bite, in wasps and bees sting, the sting spot is just one observable spot (3, 4, 7). The intensity of bee sting is different in each individual. Symptoms of bee sting include sudden pain, redness, itching, hives, swelling, breathing difficulty, faint, and anaphylactic shock. Nearly 10% of the sting cases turn red and swell in the sting spot (35, 36). Bee venom damages different organs of the body mostly near the bite area, however, it sometimes causes dangerous systematic complications. About 40 to 100 cases of death occur in America due to the allergic reactions to insect bites and stings. Deadly allergic reactions mostly occur in individuals who have a previous history of allergy to another or the same genus insect bite and stings (37, 38). In the individuals sensitive to bee stings, repeated stings cause severe complications like muscle damage, kidney failure, and even death in some cases (39-41). Velvet ants, in spite of their name, do not belong to the Formicidae family. They are not invader arthropoda and do not have group and aggressive attacks, however, they, as urban pests, can cause and stings in the urban and rural environment. The existence of the velvet ants in the outdoors such as yards, parks, and school grounds causes and stings, especially in curious children, which is painful. Mutillidae are solitary ectoparasitoid wasps commonly referred to as velvet ants due to the appearance of the dense hair that covers their bodies. Velvet ants mainly parasitize other aculeate Hymenoptera, especially bees (the family Apidae). The taxonomy of mutillids is very difficult. A remarkable feature of mutillids is their extreme sexual dimorphism. Females are entirely wingless, while males are normally fully winged. The females are known for their extremely painful sting. They invade the nests of wasps and bees and lay eggs near the larvae and pupae. Mutillid wasps comprise a diverse group of aculeate wasps, with about 4,200 described species that occur worldwide, mainly in the tropics. They are especially common in the desert, sandy, and arid regions (42-45). The mutillid fauna of Iran numbers is 78 species in 22 genera (46). According to the oral reports of the authorities and native people, this study reported the sting condition and its complications for the first time in Kashan. This study was carried out in an emergency after an unknown animal sting report in the region at personal expenses. In addition, Social Determinants of Health Research Center of Kashan University of Medical Sciences has supported this research. The study was approved by the Social Determinants of Health Research Center of Kashan University of Medical Sciences. The ethical principles of this research were investigated and discussed in the research committee of the above mentioned department and after making needed modifications, it was approved. The study has been done in accordance with the provisions of the Hillsinki Declaration. No photographs or names of individuals or patients are found in the article (47). This descriptive cross-sectional study was done during 2014 - 2015. Individuals who were stung by velvet ants in Ghotb Ravandi town and Ravand in Kashan were assessed. After the early reports in 2013, the native stung people were identified and by referring to their houses their identification data were recorded. Then, their yards, bedrooms, sitting rooms, and rest rooms were inspected and living area of this insect in the residential houses in the northern part of Ravand and Ghotb Ravandi town in Kashan was identified. Velvet ant samples were collected and transferred to the entomology laboratory of the environmental health department of the health faculty. To identify the identity of the samples, they were put in 70% ethanol with a stereo microscope and handy magnifier, then the samples were studied. According to the morphologic specifications of the samples of the insect collected in the houses of the injured, identity of the sting agent was recognized. Sting complications in the individuals were studied according to the clinical manifestation and the time of and stings from June to September. Then, data obtained from the victims were recorded and presented by figures. In this study, which was done in 2014 - 2015, the data of 49 individuals injured by velvet ant and stings from June to September were recorded. All individuals who were stung were recognized and sting agent was identified exactly. The sting agent was identified as a velvet ant, Dentilla genus. The time of stings was from June to September. All the stings, except one, occurred inside the houses. Houses were environmentally suitable for the insect’s activity and taking shelter (Figure 1). About 72% (35 individuals) of the stings had taken place inside the bedrooms, the sitting rooms, or the workplace of the women carpet weavers. The results showed that 59% (29 individuals) of stinging was done in in women and 41% (20 individuals) in men. In this study, the highest number of stung cases was in the age group of 11 - 20 years with 30.5% and the lowest belonged to the age groups of 31 - 40 and 41 - 50 years. 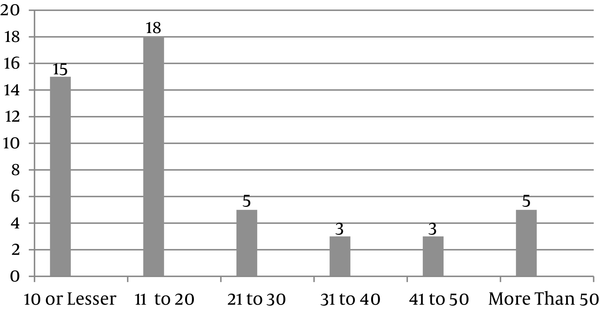 These two age groups allocated about 12.25% of the stung cases overall (Figure 2). The first stinging sign was a severe and sharp pain, which was reported by all the individuals in the first hours of the first day of stinging. Restlessness was another symptom, which was seen more in the young. The other sign of stinging was wide redness spread near the sting spot which became less by getting far from it (Figure 3). 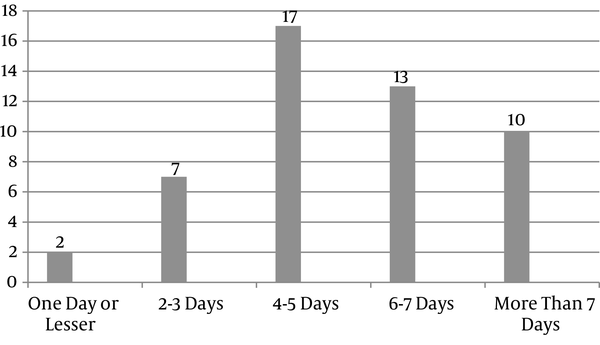 The highest percentage of redness in the first day was 47% and the lowest percentage was 4 to 5 days after the sting with 2% (Figure 4). Intense itching was one of the main symptoms of velvet ant sting. 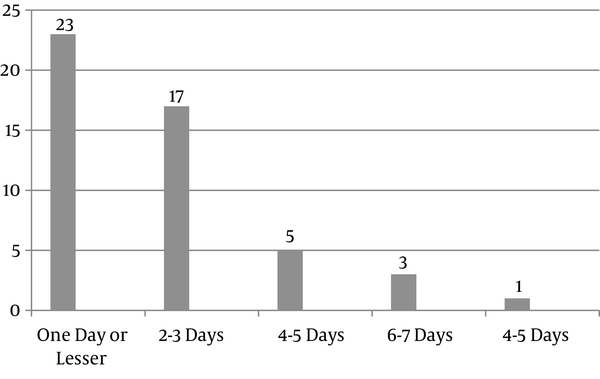 The maximum itching took place 4 to 5 days after the sting with 34.5% and the minimum itching was in the first hours of the first day (Figure 5). 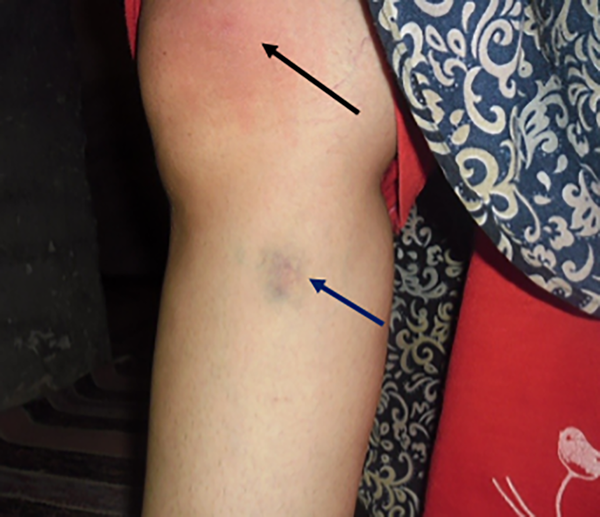 In the final stages of pain and itching, hemolysis and bruise were observed as brown spots (Figure 6). Reaction of the family members for treatment or helping the injured person was different. Five individuals had squeezed the spot by hand after being stung by a velvet ant. In 2 cases, in children, the stung spot had been sucked by the parents. In other cases, nothing had been done to extract the venom from the stung place. Different materials had been used for the treatment and reducing the pain and itching. Some people had used yogurt, garlic, oil, leek juice, and alcohol as an ointment. Some others noted that cow bile was useful in treatments. Rubbing yogurt was used more than anything else. Some people used raw potato slices on the sting spot by recommendation of older individuals. Except 3 individuals, no one else had visited health centers for treatment. The individuals who visited health centers had been given corticosteroids and calamine ointment. Figure 3. A 16 year old girl who was stung two times by a velvet ant. Note the early stages and redness of the sting (up arrow) on her knee, 3 minutes after sting, and the last stages of sting site (down arrow) on her foreleg, upper 5 days after sting. Figure 6. A 55 year old woman who was stung by velvet ant. Note the last stages of the sting site on her arm. Venomous creatures include an important health challenge in plenty regions of the globe, especially in Southeast of Asia, Tropical America, and Africa. In these parts, epidemiological researches on venomous animals are commonly restricted to envenomation by scorpions and snakes. Accordingly, low data regarding other venomous creatures is accessible. Hymenoptera stings account for more deaths in the United States than any other envenomation. The order Hymenoptera includes ants, Apis species (bees), and vespids (wasps, hornets yellow, jackets). Bee envenomation may induce two distinct clinical features, depending on the victim’s sensitivity to the venom and the number of stings. These manifestations may be toxic or allergic reactions. Most deaths result from immediate anaphylaxis and hypersensitivity reactions. Intense anaphylactoid reactions happen sometimes when venoms directly stimulate mast cells. While the vast majority of stings cause only minor problems, stings cause a significant number of deaths (48). In Iran, epidemiological data, on the incidence of bee, wasp, and ant sting cases are scarce and incomplete, which is probably due to underreporting of victims and a deficiency in recording clinical and epidemiological information. Meanwhile, death records are incomplete and a few autopsies have been done on these patients. Due to the lack of medical statistics, it is difficult to establish the severity of bee sting cases and even more difficult to estimate the seriousness of this problem in the future. In the United States, ants sting 9.3 million cases annually, while other Hymenoptera species account for more than 1 million stings each year. Anaphylaxis, secondary to Hymenoptera envenomation, affects approximately 3% of the total population. Systemic reactions leading to life-threatening manifestations happens in nearly 3% of adults and 0.4% - 0.8% of children victims. According the US Bureau of Labor Statistics, during 2003 - 2010, ants accounted for 4 fatal occupational injuries, 14 yellow jackets/ wasps, and 52 bees 52 (49-51). In 49 cases of stings, which were identified by visiting the houses in the contaminated areas, women were stung more than men by 59%. Although the ant sting was reported as painful, however, in individuals that were stung, pain and itching had not made a serious problem. This arthropod belongs to the Mutillidae family. Maybe if these individuals were stung at many times, they would face severe complications such as muscle destruction, kidney failure, and even death (52-55). These complications may be seen more in children, elders, and patients whose physical strength is weak (56-58). Of course velvet ants are not aggressive and no group attacks, like other bees and wasps, have been reported from them so far (59). All the stinging cases had happened inside the houses except one case, which was seen in a wood workshop next to these houses. Our study showed that this arthropod in this dry and tropical region had adapted itself with the residential houses’ conditions, due to the fact that the warm weather and low humidity, the possibility of survival outside the houses is low. All these houses had gardens in which the needed humidity was provided in the soil or under the yard’s brick tiles by regular water sprinkling and irrigation, which could provide the initial needs of this arthropod which was in accordance with their need in the warm summer days of the region (60, 61). On the other hand, due to high sting cases in the bedrooms, sitting rooms, or workplace of women carpet weavers, it can be concluded that this arthropod had infiltrated into the humans’ living places for escaping from the high temperature in the summer with maximum adaptability. The velvet stinging happened in June to September, which are the hottest months of the year in the central and desert areas of Iran. It can be concluded that Dentilla velvet ants enter inside the workplaces and rooms much less in the other months of the year due to the fact that the temperature outside of human living places is tolerable. There was a significant relation between the living location of people and stings. People living in the old part of the town had been stung more. This means that this insect doesn’t have the possibility of life and activity in the modern houses. So, the sting of this arthropod is somehow related to the social and economic welfare level. It seems that different factors in different societies cause the occurrence of the poisoning; therefore, in each society according to the cultural, social, and economic characteristics, proper solution for reducing or preventing the stings must be given. The results of the study showed that this arthropod, as a predaceous, selected its living place in way that providing the food during the population growth seasons would be possible (62-65). According to the climate type, the activity place of these ants are selected in a way that could keep them away from light and severe climate effects (66). It can be expressed that these ants, like other animals, as an opportunist arthropod, use different places as their nest (60, 61). The current study was encountered with some limitations including finding passive cases and not referring all the patients to County Health Centers. Second, the type of questionnaire we used was unable to assess occupation, literacy, and so on. One of the strengths of this study was establishment of Reference Laboratory in the region to infestation definitive diagnosis and treatment of sting. Another point of strength in this study was to use precision entomological key for identification of ants. Due to the high cases of stinging in the bedrooms, sitting rooms, and the workplaces of the women carpet weavers, it can be concluded that this arthropod is a domestic pest. The reasons for the highest rate could probably be due to inappropriate homes, lack of sanitation facilities, no standard conditions in these areas and living close to the insect nests. Therefore, control and prevention of their potential damages must be programmed accordingly. Scheduling for the sting control and taking suitable procedures are crucial to decrease the occurrence of the sting in this area. Health education and group training via media, combating against velvet ants, full protection during the stung season, environmental improvement plus appropriate environmental sanitation, and applying insecticides should also be incorporated in preparation for fighting against these ants. It is recommended that all the holes and wall breaks of the houses and the living places of this insect be blocked with suitable materials to prevent the stinging risk. According to the study results and prevalence of the sting in the study area, serious public health monitoring for proper preparation against the sting should be in place. Although, the number of cases stung by velvet ants in the residential regions in Kashan County was 49 during 2014 - 2015, it was thought to be that the actual number could be much higher than this. Velvet ant sting has not been reported from Kashan so far. The study also revealed that gender, age, month, season, and place of residence (indoor or outdoor) play major responsibilities in the incidence of the disease. Furthermore, the disease was found to possess a seasonal mode of frequency in the region. A detailed research of the geographic distribution, bio ecology, behavior, and control of the insect, chemical diversity of their venom, clinical features in patients, and epidemiology in the region is proposed for future studies. The study was done in a region where there was no previously reports regarding stinging velvet ants. We believe the complement of species distribution in unrevealed regions can be innovation in bioscience. Species identification has other usage in biology and biomedicine, such as the making of velvet ant anti-venom serum. This study was done in the Social Determinants of Health Research Center and Department of Environmental Health, Kashan University of Medical Sciences, Kashan, Iran in collaboration with the Department of Medical Entomology, School of Health, Ahvaz Jundishapur University of Medical Sciences, Ahvaz, Iran. Their help and consult is highly appreciated. Conflict of Interests: The authors declared no potential conflicts of interests with respect to the authorship and/or publication of this paper. 1. Dehghani R. Solpugidophobia in Iran: Real or illusion. J Biol Today's World. 2016;6(3):46-8. 2. Dehghani R, Sharif A, Madani M, Kashani HH, Sharif MR. Factors influencing animal bites in iran: A descriptive study. Osong Public Health Res Perspect. 2016;7(4):273-7. doi: 10.1016/j.phrp.2016.06.004. [PubMed: 27635378]. [PubMed Central: PMC5014749]. 3. Dehghani R, Rastegar pouyani N, Dadpour B, Keyler D, Panjehshahi M, Jazayeri M, et al. A survey on non-venomous snakes in Kashan (Central Iran). J Biol Today's World. 2016;5(4). doi: 10.15412/j.jbtw.01050402. 4. Dehghani R, Mehrpour O, Shahi MP, Jazayeri M, Karrari P, Keyler D, et al. Epidemiology of venomous and semi-venomous snakebites (Ophidia: Viperidae, Colubridae) in the Kashan city of the Isfahan province in Central Iran. J Res Med Sci. 2014;19(1):33-40. [PubMed: 24672563]. [PubMed Central: PMC3963321]. 5. Dehghani R, Sharif MR, Moniri R, Sharif A, Kashani HH. The identification of bacterial flora in oral cavity of snakes. Comparat Clin Pathol. 2015;25(2):279-83. doi: 10.1007/s00580-015-2178-9. 6. Dehghani R, Sharif A, Assadi MA, Haddad Kashani H, Sharif MR. Fungal flora in the mouth of venomous and non-venomous snakes. Comparat Clin Pathol. 2016;25(6):1207-11. doi: 10.1007/s00580-016-2330-1. 7. Dehghani R, Fathi B, Shahi MP, Jazayeri M. Ten years of snakebites in Iran. Toxicon. 2014;90:291-8. doi: 10.1016/j.toxicon.2014.08.063. [PubMed: 25193748]. 8. Yousef Mogaddam M, Dehghani R, Enayati AA, Fazeli-Dinan M, Motevalli Haghi F. Epidemiology of scorpionism in Darmian, Iran, 2015. J Mazandaran Univ Med Sci. 2016;26(141):131-6. 9. Yousef Mogaddam M, Dehghani R, Enayati AA, Fazeli-Dinan M, Vazirianzadeh B, Yazdani-Cherati J, et al. Scorpion fauna (Arachnida: Scorpiones) in Darmian county, Iran (2015-2016). J Mazandaran Univ Med Sci. 2017;26(144):108-18. 10. Shahbazzadeh D, Amirkhani A, Djadid ND, Bigdeli S, Akbari A, Ahari H, et al. Epidemiological and clinical survey of scorpionism in Khuzestan province, Iran (2003). Toxicon. 2009;53(4):454-9. doi: 10.1016/j.toxicon.2009.01.002. [PubMed: 19708123]. 11. Ghafourian M, Ganjalikhanhakemi N, Hemmati AA, Dehghani R, Kooti W. The effect of Hemiscorpius lepturus (Scorpionida: Hemiscorpiidae) venom on leukocytes and the leukocyte subgroups in peripheral blood of rat. J Arthropod Borne Dis. 2016;10(2):159-67. [PubMed: 27308274]. [PubMed Central: PMC4906755]. 12. 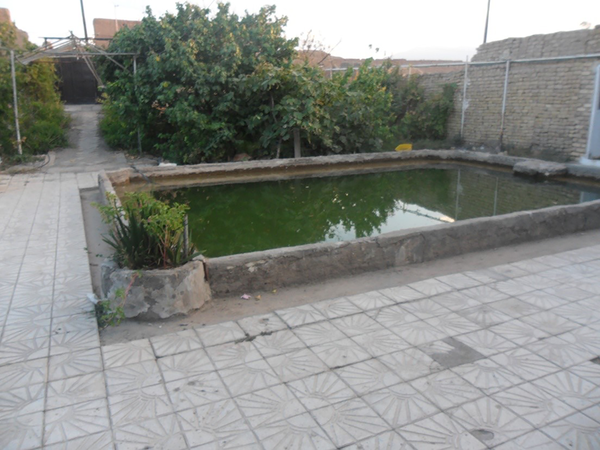 Dehghani R, Miranzadeh MB, Yosefzadeh M, Zamani S. Fauna aquatic insects in sewage maturation ponds of Kashan University of Medical Science 2005. Pak J Biol Sci. 2007;10(6):928-31. [PubMed: 19069891]. 13. Dehghani R, Zarghi I, Aboutalebi M, Barzegari Z, Ghanbari M. Fauna and habitat of aquatic arthropods of Kashan in 2010. Bangladesh J Med Sci. 2014;13(3). doi: 10.3329/bjms.v13i3.15448. 14. Dehghani R, Arani M. Scorpion sting prevention and treatment in ancient Iran. J Tradition Complement Med. 2015;5(2):75-80. 15. Sanaei-Zadeh H, Marashi SM, Dehghani R. Epidemiological and clinical characteristics of scorpionism in Shiraz (2012-2016); development of a clinical severity grading for Iranian scorpion envenomation. Med J Islamic Republic Iran. 2017;31(1):158-66. doi: 10.18869/mjiri.31.27. 16. Dehghani R, Rafinejad J, Fathi B, Shahi M, Jazayeri M, Hashemi A. A retrospective study on Scropionism in Iran (2002–2011). J Arthropod-Borne Dis. 2017;11(2):194. 17. Ebrahimi E, Carpenter JM. Distribution pattern of the hornets Vespa orientalis and V. crabroin Iran. Zool Middle East. 2012;56(1):63-6. doi: 10.1080/09397140.2012.10648942. 18. Abbasi R, Rad S, Ebrahimi E, Sheidaei M. Faunistic study of vespid wasps in Zanjan Province (Northwest of Iran) with some ecological measures. Environ Sci. 2008;6(1):65-74. 19. Abbasi R. On the distribution and taxonomy of vespine wasps of Iran (Hymenoptera: Vespidae: Vespinae). Acta Musei Moraviae Scientiae biologicae. 2012;97(2):69-86. 20. Rad S, Abbasi R, Soleimani G, Dvorak L. New and supplementary information on the vespid fauna of Iran. Zool Middle East. 2010;50(1):95-100. doi: 10.1080/09397140.2010.10638417. 21. Bagriacik N, Samin N. A checklist of Iranian Vespinae (Hymenoptera: Vespoidea: Vespidae). Arch Biol Sci. 2011;63(2):487-92. doi: 10.2298/abs1102487b. 22. Khoobdel M, Tavassoli M, Salari M, Firozi F. The stinging Apidae and Vespidae (Hymenoptera: Apocrita) in Iranian islands, Qeshm, Abu-Musa, Great Tunb and Lesser Tunb on the Persian Gulf. Asian Pac J Trop Biomed. 2014;4(Suppl 1):S258-62. doi: 10.12980/APJTB.4.2014C1153. [PubMed: 25183092]. [PubMed Central: PMC4025289]. 23. Barratt B, Willoughby BE, Wilson D, Booth AM. The yellow flower wasp, Radumeris tasmaniensis Saussure (Hymenoptera: Scoliidae): potential threat to New Zealand native fauna. N Zealand Plant Protect. 2002:25-9. 24. Diaz JH. Recognition, management, and prevention of hymenopteran stings and allergic reactions in travelers. J Travel Med. 2009;16(5):357-64. doi: 10.1111/j.1708-8305.2009.00316.x. [PubMed: 19796109]. 25. Viswanathan S, Prabhu C, Arulneyam J, Remalayam B, Adil M. Yellow jacket envenomation-related acute renal failure. NDT Plus. 2011;4(3):167-9. doi: 10.1093/ndtplus/sfr020. [PubMed: 25984147]. [PubMed Central: PMC4421610]. 26. Zhang L, Yang Y, Tang Y, Zhao Y, Cao Y, Su B, et al. Recovery from AKI following multiple wasp stings: a case series. Clin J Am Soc Nephrol. 2013;8(11):1850-6. doi: 10.2215/CJN.12081112. [PubMed: 24009218]. [PubMed Central: PMC3817916]. 27. Khoobdel M, Akbarzadeh K, Jafari H, Mehrabi Tavana A, Mousavi Jazayari A, Rafienejad J, et al. Ant sting in military forces on three Persian islands of Abu-Musa, Great Tonb and Lesser Tonb. J Mil Med. 2012;14(2):155-62. 28. Khoobdel M. Pachycondyla sennaarensis, sting ants on Persian Gulf Islans. J Mil Med. 2014;15(4):233-4. 29. Akbarzadeh K, Nateghpour M, Tirgari S, Abaei MR. Medical importnace of fire Ant Pachycondyla sennaarensis (Hymenoptera: Formicidae) in Iranshahr and Sarbaz Counties, Southeastern of Iran. J Med Sci. 2006;6(5):866-9. doi: 10.3923/jms.2006.866.869. 30. Nikbakhtzadeh MR, Akbarzadeh K, Tirgari S. Bioecology and chemical diversity of abdominal glands in the iranian samsum ant Pachycondyla sennaarensis (Formicidae: Ponerinae). J Venomous Animals Toxins Trop Dis. 2009;15(3):509-26. doi: 10.1590/s1678-91992009000300012. 31. Rafinejad J, Zareii A, Akbarzadeh K, Azad M, Biglaryan F, Doosti S, et al. Faunestic study of ants with emphasis on the health risk of stinging ants in qeshm island, iran. Iran J Arthropod Borne Dis. 2009;3(1):53-9. [PubMed: 22808373]. [PubMed Central: PMC3385528]. 32. Tirgari S, Paknia O. First record of the ponerine ant Pachycondyla sennaarensis (Hymenoptera: Formicidae) in Iran, with notes on its ecology. Zool Middle East. 2013;34(1):67-70. doi: 10.1080/09397140.2005.10638084. 33. Paknia O. Distribution of the introduced ponerine ant Pachycondyla sennaarensis (Hymenoptera: Formicidae) in Iran. Myrmecologische Nachrichten. 2006;8:235-8. 34. Paknia O, Radchenko A, Alipanah H, Pfeiffer M. A preliminary checklist of the ants (Hymenoptera: Formicidae) of Iran. Myrmecol News. 2008;11:151-9. 35. Severino M, Bonadonna P, Passalacqua G. Large local reactions from stinging insects: from epidemiology to management. Curr Opin Allergy Clin Immunol. 2009;9(4):334-7. doi: 10.1097/ACI.0b013e32832d0668. [PubMed: 19458526]. 36. Golden DB, Moffitt J, Nicklas RA, Freeman T, Graft DF, Reisman RE, et al. Stinging insect hypersensitivity: a practice parameter update 2011. J Allergy Clin Immunol. 2011;127(4):852-4 e1-23. doi: 10.1016/j.jaci.2011.01.025. [PubMed: 21458655]. 37. Bilo BM, Bonifazi F. Epidemiology of insect-venom anaphylaxis. Curr Opin Allergy Clin Immunol. 2008;8(4):330-7. doi: 10.1097/ACI.0b013e32830638c5. [PubMed: 18596590]. 38. Valentine MD, Schuberth KC, Kagey-Sobotka A, Graft DF, Kwiterovich KA, Szklo M, et al. The value of immunotherapy with venom in children with allergy to insect stings. N Engl J Med. 1990;323(23):1601-3. doi: 10.1056/NEJM199012063232305. [PubMed: 2098016]. 39. Lin CJ, Wu CJ, Chen HH, Lin HC. Multiorgan failure following mass wasp stings. South Med J. 2011;104(5):378-9. doi: 10.1097/SMJ.0b013e318213ebee. [PubMed: 21606727]. 40. Turbyville JC, Dunford JC, Nelson MR. Hymenoptera of Afghanistan and the central command area of operations: assessing the threat to deployed U.S. service members with insect venom hypersensitivity. Allergy Asthma Proc. 2013;34(2):179-84. doi: 10.2500/aap.2013.34.3638. [PubMed: 23484895]. 41. Pumphrey RS. Lessons for management of anaphylaxis from a study of fatal reactions. Clin Exp Allergy. 2000;30(8):1144-50. [PubMed: 10931122]. 42. Lelej AS. Catalogue of the Mutillidae (Hymenoptera) of the Palaearctic region. Vladivostok: Dalnauka; 2002. 43. Lelej AS, Gharali B, Lotfalizadeh H. New records of velvet ants (Hymenoptera: Mutilidae) from the west of Iran. Far Eastern Entomologist. 2008;(191):1-7. 44. Lelej AS, Osten T. To the knowledge of the mutillid and bradynobaenid wasps of Iran (Hymeno-ptera: Mutillidae, Bradynobaenidae). Proceedings of the Russian Entomological Society. St. Petersburg. 2004. p. 253-62. 45. Luz DR, Waldren GC, Melo GAR. Bees as hosts of mutillid wasps in the Neotropical region (Hymenoptera, Apidae, Mutillidae). Revista Brasileira de Entomologia. 2016;60(4):302-7. doi: 10.1016/j.rbe.2016.06.001. 46. Lelej AS, Harten AV. Arthropod fauna of the UAE. UAE Insect Project; 2010. 47. The World Medical Association. WMA declaration of Helsinki - ethical principles for medical research involving human subjects. 2018. Available from: https://www.wma.net/policies-post/wma-declaration-of-helsinki-ethical-principles-for-medical-research-involving-human-subjects/. 48. Linard AT, Barros RM, Sousa JA, Leite RS. Epidemiology of bee stings in Campina Grande, Paraiba state, Northeastern Brazil. J Venom Anim Toxins Incl Trop Dis. 2014;20:13. doi: 10.1186/1678-9199-20-13. [PubMed: 24694193]. [PubMed Central: PMC3997214]. 49. Galera C, Soohun N, Zankar N, Caimmi S, Gallen C, Demoly P. Severe anaphylaxis to bee venom immunotherapy: efficacy of pretreatment and concurrent treatment with omalizumab. J Investig Allergol Clin Immunol. 2009;19(3):225-9. [PubMed: 19610266]. 50. Hernandez M, Gonzalez S, Galindo G, Diaz A, Rodriguez P. Reactions to hymenoptera sting in adult patients: experience in a clinical allergy/immunology service in Monterrey Mexico. World Allergy Organiz J. 2007:S216-7. doi: 10.1097/01.WOX.0000301943.52681.6d. 51. Pegula S, Kato A. Fatal injuries and nonfatal occupational injuries and illnesses involving insects, arachnids, and mites. Workplace Injur. 2014;3(17). 52. Atmaram VP, Mathew A, Kurian G, Unni VN. Acute renal failure following multiple wasp stings. Indian J Nephrol. 2005;15(1):30-2. 53. Radhakrishnan H. Acute kidney injury and rhabdomyolysis due to multiple wasp stings. Indian J Crit Care Med. 2014;18(7):470. 54. Rachaiah NM, Jayappagowda LA, Siddabyrappa HB, Bharath VK. Unusual case of acute renal failure following multiple wasp stings. N Am J Med Sci. 2012;4(2):104-6. doi: 10.4103/1947-2714.93380. [PubMed: 22408758]. [PubMed Central: PMC3296316]. 55. Kumar V, Nada R, Kumar S, Ramachandran R, Rathi M, Kohli HS, et al. Acute kidney injury due to acute cortical necrosis following a single wasp sting. Ren Fail. 2013;35(1):170-2. doi: 10.3109/0886022X.2012.741467. [PubMed: 23173621]. 56. Ullah P, Chowdhury A, Isha IT, Mahmood S, Rabbi Chowdhury F, Zeesan-ul-Abir M, et al. Wasp stings (Vespa affinis) induced acute kidney injury following rhabdomyolysis in a 25-year-old woman. J Emerg Practice Trauma. 2016;2(2):55-7. 57. Yang L. Acute kidney injury in Asia. Kidney Dis (Basel). 2016;2(3):95-102. doi: 10.1159/000441887. [PubMed: 27921036]. [PubMed Central: PMC5123008]. 58. Zhang YH, Li J, Zhang F, Wang T, Zheng Y, Guo DY, et al. Application of high-volume hemofiltration combined with hemoperfusion for patients with wasp sting accompanied by multiple organ failure. Chinese J Pract Intern Med. 2009;29(11):1027-9. 59. Cheng YN, Wen P, Dong SH, Tan K, Nieh JC. Poison and alarm: the Asian hornet Vespa velutina uses sting venom volatiles as an alarm pheromone. J Exp Biol. 2017;220(Pt 4):645-51. doi: 10.1242/jeb.148783. [PubMed: 27923877]. 60. Dehghani R, Kamiabi F. Frequency of Odonthubutus doriae Thorell 1876 nests in desert soils, esfahan, Iran. J Entomol Res. 2017;41(1):13. doi: 10.5958/0974-4576.2017.00003.2. 61. Dehghani R, Kamiabi F, Mohammadzadeh N. Burrowing habits of two Arthropods; Odenthobutus doriae and Hemilepistus schirasi in desert of Isfahan, Iran. J Entomol Res. 2017;41(2):113-8. 62. Perrard A, Haxaire J, Rortais A, Villemant C. Observations on the colony activity of the Asian hornetVespa velutinaLepeletier 1836 (Hymenoptera: Vespidae: Vespinae) in France. Annales de la Societe entomologique de France (N.S.). 2013;45(1):119-27. doi: 10.1080/00379271.2009.10697595. 63. Dehghani R, Khamehchian T, Miranzadeh MB. Surveying on the Biologic Behaviors of Hemiscorpius Lepturus Peters 1861, Scorpion in Laboratory (Khuzestan, Iran) (Scorpions: Hemiscorpiidae). Pak J Biol Sci. 2007;10(18):3097-102. doi: 10.3923/pjbs.2007.3097.3102. 64. Nakamura M, Sonthichai S. Nesting habits of some hornet species (Hymenoptera, Vespidae) in Northern Thailand. Kasetsart J Nat Sci. 2004;38:196-206. 65. Dehghani R, Valizade R, Mahmoodi S. A review of the scorpion predators and the introduction of Scarites subterraneus, as a new predatory of them in Iran. J Entomol Res. 2016;40(3):291-6. 66. Gefen E, Ar A. Temperature dependence of water loss rates in scorpions and its effect on the distribution of Buthotus judaicus (Buthidae) in Israel. Comparat Biochem Physiol Mol Integrat Physiol. 2006;144(1):58-62. doi: 10.1016/j.cbpa.2006.02.002.